In yesterday’s post we talked about Flipgrid and explained how you can use it to formatively assess students using video-based activities. Today, we are sharing with you another excellent tool for formative assessment but this time you can do it from within your Google Slides through the use of Pear Deck add-on. We have been tinkering with this tool for awhile and we found it really helpful. Pear Deck add-on for Google Slides provides you with a collection of pre-designed templates you can choose from to create formative assessments and engage your students in interactive learning experiences. You can choose from templates that embed activities for the start of a lesson or activities to check your students understanding during a lesson. And if you want to create an exit ticket at the end of the lesson, there is a template for that too. You can also make your slides interactive through the addition of questions. 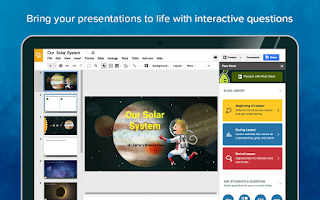 The way Pear Deck works on Google Slide is simple and easy: install the add-on, select which templates you want to use in your presentation, fill in the sides with your content and when your presentation is ready make sure you present it through Pear Deck by clicking on the ‘Present with Pear Deck’ button at the top right corner. Your students will be able to join your Pear Deck presentation from the web. As you go through the presentations students will be prompted to answer your questions. You will see their answers in realtime or display them anonymously on the classroom projector. 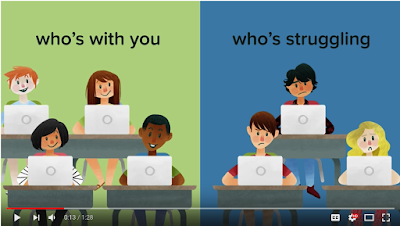 Watch the video below to learn more about Pear Deck for Google Slides Add-on. Courtesy of Nick Park (@npPearDeck) through whose tweet we learned about this feature.